To automate this operation, first we need to capture the images of the GUI elements that need to be clicked. These captured images will be inserted into the Script editor. Then, we can write a sequence of three click() statements to click on the three elements that need to be clicked in order. Notice how closely these three lines of code are mapped to the text description of the three-step operation earlier. 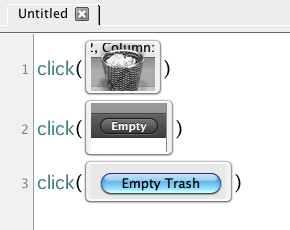 We simply replace the description of each GUI element (e.g., Trash bin) by its image directly. How intuitive it is! Before running the script, make sure the Trash icon is visible on the screen, otherwise Sikuli Script can not find it.